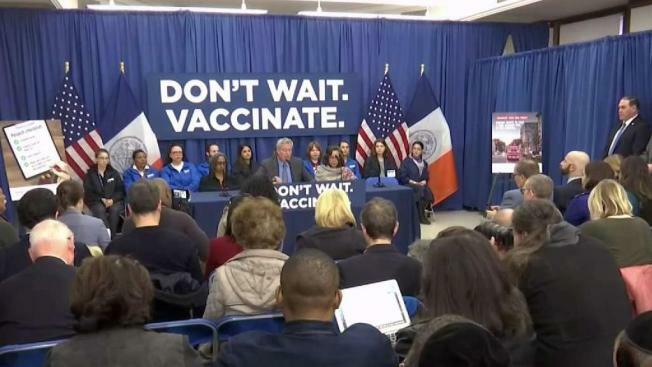 Mayor Bill de Blasio declared a public health emergency Tuesday amid a measles outbreak — the worst outbreak in New York City since 1991. The declaration comes after the New York City Health Department ordered all ultra-Orthodox Jewish schools in a neighborhood of Brooklyn on Monday to exclude unvaccinated students from classes during the current measles outbreak. The health department said that any yeshiva in Williamsburg that does not comply will face fines and possible closure. 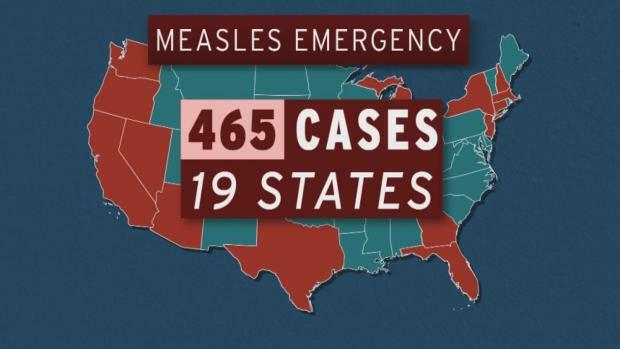 The measles outbreak has worsened in pockets of the United States. At least 465 cases of measles were reported so far in 2019, according to the Centers for Disease Prevention and Control. "We have a very dangerous situation on our hands," De Blasio said Tuesday. "We cannot allow this dangerous disease to make a comeback here in New York City. We have to stop it now." City health officials said the measles outbreak among Orthodox Jewish communities continues to increase "at an alarming rate." Officials say 285 cases have been confirmed in New York City since the beginning of the outbreak in October. Most cases have been reported from Williamsburg and Borough Park - two Brooklyn neighborhoods with large Orthodox Jewish populations, in which vaccination rates tend to be lower. New York City accounted for about two-thirds of all U.S. measles cases reported last week. But areas outside the city are also seeing a surge in cases. Last week, a state judge issued a preliminary injunction against a Rockland County emergency order banning children from public places unless they've been vaccinated against measles. Civil rights lawyer Michael Sussman called the order "arbitrary and capricious." The county had enacted the 30-day emergency order to fight a measles outbreak that has infected at least 166 people since October. Rockland's outbreak has most heavily affected Orthodox Jewish communities. Health officials say the best way to stop the disease's spread is a vaccination rate in the community of 92 to 95 percent. Mayor de Blasio will hold a press conference Tuesday to make an announcement on the growing measles outbreak across the Big Apple.